Looking for a new appetizer for your next barbecue? 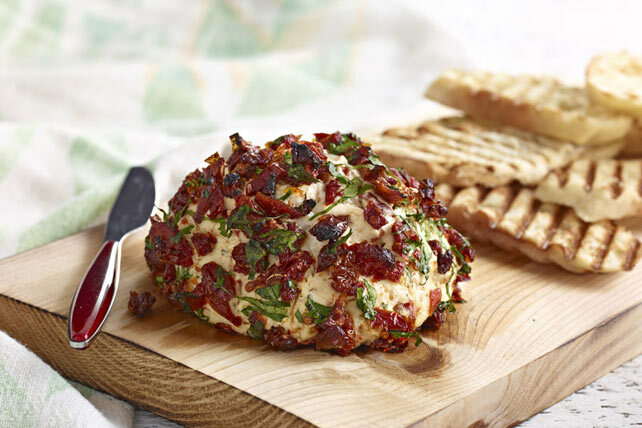 This warm, melted cheese spread is prepared on the grill for easy summer entertaining. Immerse plank in water, placing weight on top of plank to keep it submerged. Soak 4 hours. Beat cream cheese products with mixer until blended. Stir in 2 Tbsp. tomatoes. Shape into ball; roll in remaining tomatoes, then parsley until evenly coated. Heat barbecue for indirect grilling: Light one side of barbecue, leaving other side unlit. Close lid; heat barbecue to 350ºF. Place cedar plank on barbecue grate over unlit area; top with cheese ball. Cover. Grill 15 to 20 min. or until cheese ball starts to soften, monitoring for consistent grill temperature. Serve with toasted French baguette slices. To toast the bread slices, just place them on the barbecue grate for the last 5 min. of the cheeseball grilling time, turning after 3 min. Save 30 calories and 4g of total fat, including 2.5g of saturated fat, per serving by preparing with Philadelphia Light Brick Cream Cheese Spread and Philadelphia Herb & Garlic Light Cream Cheese Product.